On the Internet one can find a bunch of KPIs for measuring virtually everything including a sales process. The first problem is that in most cases those are simple metrics that have nothing to do with KPIs. Second, it is really hard to figure out how to make use of those metrics. Use them on a dashboard, use them for making “informed decisions,” converting “data to knowledge”… Beyond these buzz phrases it is hard to find the real advantage of using a specific indicator, and this article is going to help. Before we talked about HR KPIs, and now it’s time to sort out things for sales KPIs. Initial request. Potential customers might contact you with some question or your sales people might be making calls to reach a potential customer. Some of the business opportunities end up in meaningful conversations. Once a prospect is near a final decision we are talking about a qualified lead. A qualified lead is then closed into a sale. That is the main sales process. What about roles? There are sales reps and there is a manager. When we are talking about KPIs we are talking about a managerial tool. Managers user KPIs to monitor process, motivate sales reps for better results and ideally, to make the sales process go better. Sales KPIs online - sign-up with a free account for immediate access to 16 scorecard templates. On each stage of this process we can measure a conversion rate in percentages. For each stage sale managers tend to use a special name for this conversion rate. It doesn’t matter what name one uses, we are still talking about a conversion rate from one stage to another. Are these rates KPIs? Technically speaking they are. They meet criteria that we discussed in the previous article. Let’s take “reach rate” as an example. It is an indicator as it shows the percentage of potential clients that were converted in opportunities. It affects sales performance directly; if a sales manager will be able to double the value of this KPI, the performance of sales department suppose to boost as well. From the viewpoint of a sales manager it is one of the key metrics. What’s the problem with these KPIs then? They are lagging KPIs, they tell us a story of what has happened, but don’t really tell a manager how to change a situation. Still, these process KPIs are useful, we can put them on a performance dashboard and use them to monitor the performance. They won’t work as early warning signals, but still will be helpful to keep an eye on the process. Quantity of leads needed in sales funnel, #. As it was discussed above each stage of sales funnel has a certain conversion rate. Knowing these rates we can calculate the number of leads/opportunities that we need to have initially to convert them into a certain number of sales. Conversion rate to sales, %. This indicator shows how good our sales rep is converting opportunities to sales. Together with benchmarking information this indicator can tell us a lot about the quality of the process and performance of a sales rep. Conversion to qualified leads, %. Some managers like to measure a conversion rate to a qualified lead, but in most cases qualified lead is a vague concept that can be hardly formalized. Make sure you have a precise profile of a qualified lead. Qualified leads close rate, %. The same can be told about a close rate. While the idea of closed sale is clear, the concept of qualified lead is vague and is a subject of gaming from side of employees. Average sales cycle time. Obviously you want to have the shortest sales cycle time, but this is not necessary that it be adjusted with resulted sales. 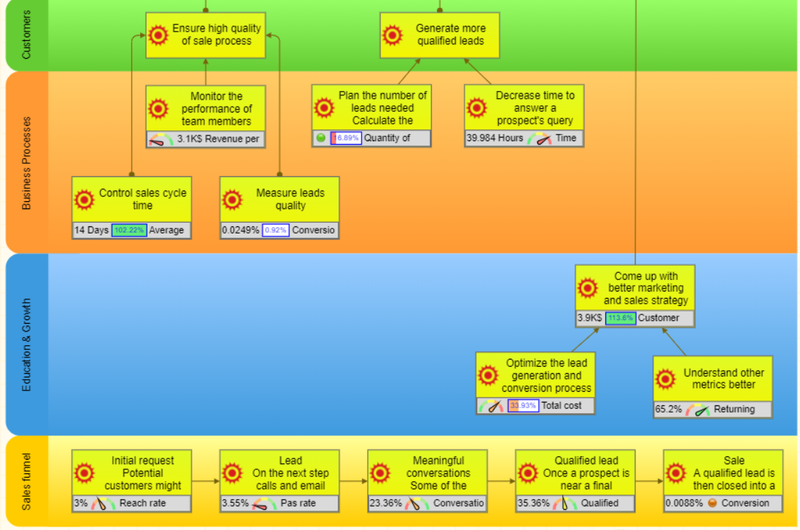 It makes sense using this indicator as a KPI if you have some statistical information about a better sales cycle time. For example, if you know (you have some data that proofs this) that the highest chance to sell a product is within 15 days from an initial contact, then it might be a good idea to control this indicator and ask your employees to shrink the full sales cycle in 15 days. There supposed to be more useful leading KPIs, they will help a manager to actually manage the performance! Fur sure they exists, but huge lists of sales KPIs from the Internet have nothing to do with leading KPIs. These KPIs are normally the result of a long-term research in a company when some consistent patterns are found. Some insights can be concluded using a common sense, while some will be a surprise even for business owners. Time to answer a prospect’s query, hours; benchmark: 1 hour. These conclusions might be tricky. 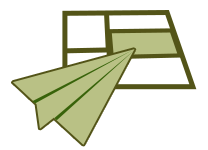 For example, data that is spread over the Internet say that according to the research by “The National Sales Executive Association 80% of sales are made on the 5th to 12th contact.” Mysterious “National Sales Executive Association” never existed, and the whole message seems to be a promotional trick, but that’s not the point right now. Why do you think sales professionals don’t follow up on a certain prospect? In most cases they do so because of the poor quality of the prospect. It simply doesn’t have a budget for what is offered or simply don’t need it. Does it make sense to have KPI like “the number of follow-up contact?” I believe that it depends on the business, but in most cases it is excess. After a relocation I was looking for a new sports gym near our house. I’ve screened some options and choose the best one according to my requirements. Within two months I’ve got four calls from a representative of a gym that was not selected. The conversation always ended up when I explained that I have already found what I needed. I was offered a small discount, but this did not make any sense in my case. The sales person acted accordingly the organization’s sale script. Their KPIs, if they have ones, were in the green zone. But try to guess, if they ever asked me why I prefer another gym? No! Their followup strategy had little to do with common sense. Who are your best customers? Why did they decide to buy your product? Do you know the decision marking cycle of your best clients? How do they evaluate your product? How do your customers find you? What is the most effective source of leads? Your findings might be surprising. You might discover that the actual decision making takes more than one year, that your best customers speak Spanish or that they trust their LinkedIn contacts much more than costly advertising that you paid for already. In an example with a sport gym. They could do better if they would find out the drivers of my interest. It was not a hard job to do, a sales rep just needed to put down and analyze the questions that I asked when I was visiting them. Having a list of most common drivers of client’s interest could help them to come up with great leading KPIs. Total cost to gain a new customer, $. This KPI will help to optimize the whole lead generation and conversion process. Revenue per sales rep, $. This KPI together with historic benchmarks will tell how team members are performing. Customer lifetime value, $. The same as above, it will help to come up with better marketing and sales strategy. New customers versus returning customers, %. From the first look this metrics is more relevant to brand awareness, but this indicator will help to understand other metrics better as well. For example, it is obvious that all conversion rates will be higher for returning customers. Check out BSC and KPIs – Sales.bsc scorecard online. You will find there KPIs that were discussed above. Now it’s a time to put all these KPIs together. Prepare a sales dashboard with average conversion rates over a period of time. This will help you to monitor the current performance and warn if you something is going on. Add big-picture sales KPIs to your Balanced Scorecard. Here is how it might be in BSC Designer software. Don’t forget to map your strategic objectives and link them to KPIs. Research historical data of your company carefully to find out the drivers of success of your offer and your product. This will provide you to more leading KPIs that will actually help to make a difference. What is your experience with sales KPIs? Do you monitor some KPIs regularly? What is your favorite leading KPI? 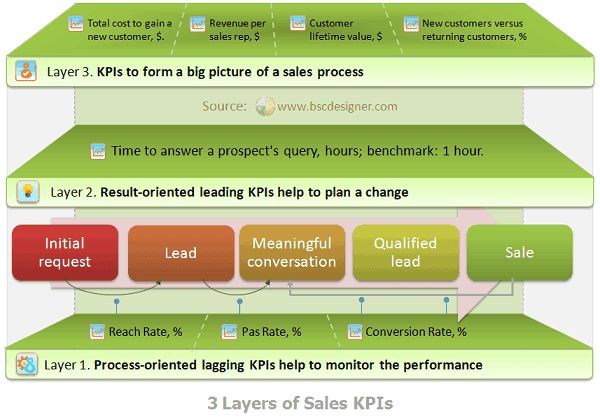 Sales KPIs discussed in this article as a starting template for your own scorecard!